Today is the brightest day in Los Angeles Clippers’ history. For the entire 30-year history of the L.A. Clippers, Donald T. Sterling has owned the team and has had numerous off-court troubles and on-court humiliations to make nearly all in Clipper nation wish he would just go away. Today, that vocal majority finally gets its wish – kind of – as Sterling was issued a lifetime ban from the NBA for his ridiculously racist and hateful words. Oh yes I do, and let me tell you what's up! Of course, this situation is all about Sterling’s gross racism and the TMZ recording that has outraged pretty much anyone who’s heard it. But on another level, this is a public-relations disaster that stems from changes within the Clipper organization — notably, the resignation of long-time public relations guru Joe Safety in June. Before I reveal some of the behind-the-scenes things I saw working close to Sterling for seven years, I must be honest of what my relationship with the Clippers is now. Although there may be a few in the organization that I still do know, I have not attended a Clippers game since I stopped covering the team in 2008. So, yes, there is a definite gap in my coverage of the team, but, strangely, I believe my perspective gives more insight to why and how Sterling made his remarks and how he got banned by the NBA today. I consider myself a bit of an intellectual (or, smirk, at least a pseudo-intellectual), and I tried to cover the Clippers with a thoughtful approach and still keep some sort of world view in the NBA land of constant injuries, game stories and watching media members eat dinner — like members of cattle. During my first year covering the team, I wanted to do an interview and story on Sterling. However, I was politely explained by the team’s public relations director, Joe Safety, that Sterling does not speak to the media. Really? Never? I pushed a little bit to get that interview, but eventually, I acquiesced and focused on other issues on the Clipper beat. A year or two after that, I again went through the same song and dance with Safety about interviewing Sterling, and I never got an interview. Even with this difference of opinion about the merits of interviewing Sterling, I must point out that I loved – and still love – Joe Safety. With the exception of towing the company line with no Sterling interviews, he was exceptionally accommodating in all other regards. I had many lengthy talks with him and Elgin Baylor and the key Clipper personnel in my tenure covering the Clippers, and I consider Safety a friend (even though I have completely left the NBA world behind and haven't spoken to him in a few years). I went through long stretches with letting the “no Sterling interview” policy stand without confrontations and one day, wrote this article that Safety objected to. If anything, I thought the story was too kind to Sterling. Without interviewing Sterling, I used words like “enigmatic” and “misunderstood” to describe him. With the scandal entrenching Sterling now, perhaps those words should have been “racist” and “revolting.” Presumably, he was like this all the time but simply was shielded from the media. The bottom line for me bringing up all of this, and even writing about the Clippers, is to point out that it is no coincidence that Sterling’s scandal is happening in the first year without Joe Safety in the organization. Safety resigned in June, and I argue that no one understood Sterling better than Safety. If that’s an exaggeration, then it’s safe to say that no one in the p.r. world understood Sterling better. Like a ruler gone mad with power, Sterling became less hidden during the Clippers’ recent successes with superstars Chris Paul and Blake Griffin. 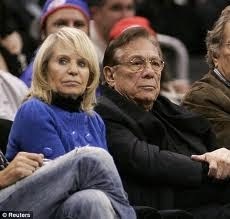 He was always a smug, smirking a-hole at the old Clipper games, but usually, his wife since 1955, Shelly, was by his side. Nowadays, he amped that image up beyond belief as the Clippers became the best NBA team in L.A. and the 80-year-old found himself a 31-year-old mistress and brought her to games. I have always found Sterling to be absolutely obsessed with his image, and in a season in which the Clippers and Lakers swapped identities, he could not deal with that change and went even more bonkers. Sterling was always a racist, but he kept it hidden to many. I imagine he always had mistresses, but he never brought them front and center to Clipper games. So now, without the perpetual Safety shield, he is finally hit with a scandal that is going to kill him (perhaps literally). Of course, it should be pointed out that Sterling is being brought down by a taped conversation, and that may have nothing to do with his dealings with the media. That is true to an extent, but with modern media and without Safety's p.r. wizardry, it may have been just a matter of time before the Sterling bomb exploded like it has done with this episode. I am not saying that the Clippers’ current media staff has any blame whatsoever with the Sterling scandal, but Safety truly was a Sterling maestro to prevent this time bomb from exploding for the 20 years he worked with the Clippers. He also was the media director for the New York Yankees when George Steinbrenner was at the helm. He also was with the Pittsburgh Pirates for their “We Are Family” era in the 1970s. The guy is legit, and through the years and through the constant lawbreaking and horrific incidents connected to Sterling, the Sterling Clipper ship still sailed. Now, that ship has sailed. I imagine there will be a lot of legal wrangling before this situation is even close to having a resolution. However, I do know that for the first time in his life, Sterling needs to accept responsibility for his words and actions. I certainly don't expect that. And, maybe, for the first time in his life, he should try something new … face the media. I pointed out that both Joe Safety and media relations director Rob Raichlen leaving as the team grew better was suspicious. To me, they knew it was time to leave.